Looking for something to do with your dog? Want to join a group of people passionate about dogs? The Greater Miami Dog Club has been the champion of dogs since 1947 and we continue to work to protect and preserve the health and welfare of our canine companions. Our April meeting will be held on Wednesday April 10, 2019 at 7:30 PM at Denny's located at 87th Avenue and Bird Road in Miami. Be sure to join us for this meeting to hear the results of our exciting Spring All-breed shows. Please contact us with any questions on upcoming meetings dates and times or dog related questions via email. Guests are always welcome so please remember to invite a dog loving friend to come along! Our Spring shows this year were on March 30 and 31, 2019 and we want to thank all our members who worked so hard during the shows and also everyone who entered your dogs. You all helped make our three-show weekend a big success! 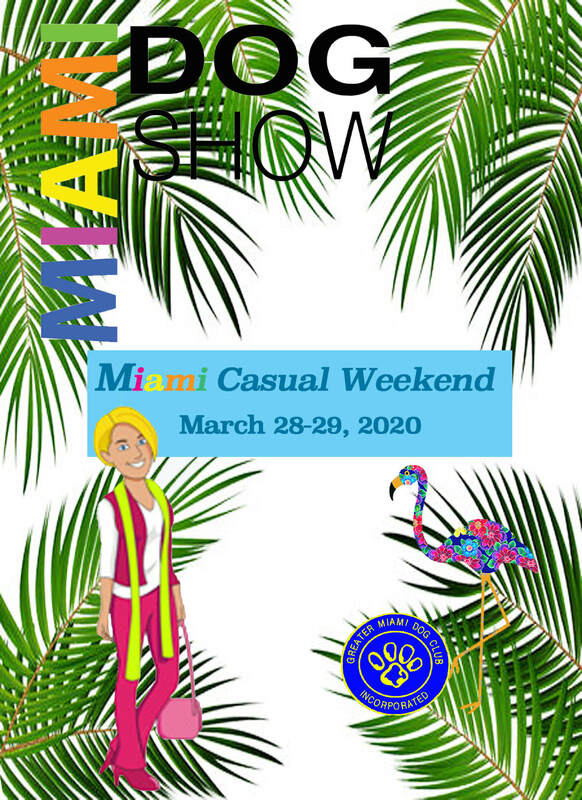 We invite you to join us again next year for our Miami Casual weekend of shows. We look forward to seeing you in your Miami Casual!